Since our last post we’ve been really busy taking the insights from the research presented in Turkey and turning it into materials that should be helpful for the different types of company we identified. In parallel with this we’ve been looking at how companies in supply chains can use these new media tools – and what reasons they might have for not using them in the same way as, say, an independent marketing consultant. So we’ve created a new, foundation workshop that lasts half a day and helps you answer these 3 questions. What story should I be telling? – how does it relate you to your client? – what change are you bringing and why is it important? How do social media work? Can I get an overview? How does it relate to the rest of my marketting? What’s the right balance between on-line an traditional marketing. What’s the right balance for me. The key insight we took from the latest phase of the research was that the degree of online activity that you need depends on whether your business is limited by supply or by demand, and how far beyond your own local area you want to do business. In my own business, we have examples of different types of activity. My consultancy business is global (in that I sometimes get business from overseas from people I’ve never met) but non scalable in that once my time is sold it’s gone. It benefits from a considerable amount of online activity. By contrast our organic vegetables business is local and limited by how much we can grow. It’s all sold by conventional face to face selling and networking and the token web presence is only there because people expect you to have one. The key thing to remember is that the same rules apply on-line as off-line and that we see this even on a local scale as we have a 1st Friday group in Lewes which meets once a month for random networking but is promoted extensively via twitter. We’ll tell you a bit more about this soon. In the meantime, our next workshop is on 7th May at Arora Hotel Gatwick priced at £77 – workshop runs from 9.3o -12.30. It will be a foundation workshop. More details here. The debate centred on the extent to which people might in future be prepared to pay for online services they have until now obtained for free. Those in favour of ‘free’ argue that because digital goods have a low marginal cost they can be given away and profits made from advertising or from selling related high margin items (think of free digital music but expensive gigs and associated merchandise). In contrast, Alan Patrick has argued that free services are not sustainable because they have largely been subsidised by venture capital. This is likely to run out at some point soon and advertising revenues are only large enough to sustain the biggest players. Bruce Daisely made the point that YouTube’s free video service now accounts for 10% of total bandwidth consumption – which knocks a big hole in the argument that the marginal costs of digital services are close to zero. Victor Keegan noted that the danger with free services such as Gmail is that there is no recourse to users should the service fail and their data be lost, though our research summarised here has identified a number of small firms who have ‘punched above their weight’ using free online tools. Azeem Azhar also reminded the audience that free services have encouraged major innovations such as open source software. The ‘freemium’ model seems a sensible compromise and Charlie Blake Thomas drew upon the example of Huddle which offers free services to minimise barriers to entry to its basic project management services, but charges for higher level services offering additional features and better security. The audience seemed surprisingly open to the notion of paying for online services, and there was a good question about how small businesses were expected to compete with free services offered by competitors when they could expect little return from an advertising-based business model. What is clear is that significant change is on the horizon, as the online world is not immune from the pressures of global recession. The biggest problem many marketers face today is how to keep up to date with the rapidly changing marketing practice being driven by developments in technology. Blogs, social networks and other user generated content online, makes ‘word of mouse’ an even more powerful and far-reaching phenomenon. Lisa and Alan will provide an overview into the latest developments in web-based customer communications. We will also consider customer receptivity to online marketing and the implications of encouraging customer feedback, collaboration and product endorsement at the expense of controlling the marketing message. 20th November 2008 from 6pm – 8pm in Building 2, University of Southampton. Marketing is about creating a good story that connects you with your customers, and telling it in the right places – especially on the Web. Now we present the case studies – an opportunity to discover the secrets of three successful online businesses. Alan and Lisa will explain how they talked to several early adopter small companies during their current research programme who have become quite sophisticated in how they use online and Web 2.0 techniques to help them ‘punch above their weight’ and look more substantial to prospective clients and collaborators. Three ‘best practice’ early adopter companies will be discussed from the many that participated in the research programme. Dr Alan Rae is Managing Partner of Ai Consultants, which researches how small companies use IT and the Internet. He develops training programmes for small companies or those who need to work with or sell to them. He is a Fellow of The Chartered Institute of Marketing and sits on its Membership Group. Dr Lisa Harris is Senior Lecturer in Marketing, a Chartered Marketer and Director of the Chartered Institute of Marketing. She is currently working with Alan on a number of follow-ups to the Punch Above Your Weight online marketing research programme. 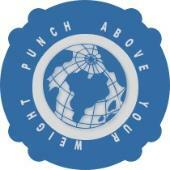 Punch above your Weight is dedicated to helping you build an effective on-line presence. Here’s a list of 50 sites that will help you. some we’ve told you about but some are new. With many thanks to The Web Pitch for this review. Tribes is the newest addition to Seth Godin’s ongoing work of easily readable ideas on “Changing The World”. Godin uses a number of real world examples and a number of short stories to underpin the ideas within Tribes. There is nothing in the book that many of us don’t already know, at least on a subconscious level. In certain situations, we must find the initiative to lead. Many of us lead tribes, even if we don’t always see it that way. The book leads the reader into thinking about how we can all challenge the status quo in our everyday personal and professional lives by taking the lead. Godin is a master at dusting off conventional concepts and presenting them in an enlightening and refreshingly new way. He demonstrates the importance of not only leading a tribe of followers, but also nurturing the relationships within it. One of the most powerful aspects of the book is how it is written to speak directly to the reader. Tribes is not written as a conventional book with chapters. The book is written more in the style of a conversation, resulting from ideas and conversations from Godin’s blog. The book is essentially a collection of those thoughts, presented beautifully in print. It is a quick read and does inspire the reader to look at ways where he/she can make a real difference and empower groups of people. Controversially, Godin describes most people within organisations as “sheepwalkers” – those who “have been raised to be obedient” and those that are comfortable “with brain-dead jobs and enough fear to keep in line.” For at least a few, leadership brings empowerment and brings opportunities to challenge traditional ways of doing things for the better. There is a feeling that Godin is in fear. Fear of a world without “everyday” leaders who continue to change things for the better. These everyday leaders are not big CEOs, but rather people like you and me. The book is indeed a call to action. 1. “Everyone in an organisation, not just the boss is expected to lead”. 3. Individuals, and their organisations that “change things and create remarkable products and services” are rewarded in the marketplace. 4. Change is a catalyst and can empower each of us to do something truly remarkable. It is “engaging, thrilling, profitable and fun”. Godin states that great leaders “create movements by empowering the tribe to communicate” and “they establish the foundation for people to make connections, as opposed to commanding people to follow.” Powerful leaders connect members of a tribe by a common interest (e.g. by sharing a passionate goal), and a determination to create things that did not exist before. Critics may argues that the book lacks “concrete data”. However, long-time Seth Godin readers will understand that his books are a presentation of ideas. Ideas that spread and win. Tribes is no different. The book could also be criticised for being too short. However, it is extremely well written and in my opinion the right size for the material it covers. After reading the book, I was left thinking that Tribes was Volume 1. Certainly, another book could soon become a follow up. For example, what effects are realised when tribes collaborate with other tribes forming a “Super Tribe”? Or, what does the leader do when his role is challenged within the tribe? It’s hard to escape the religious metaphors in the book. References to “heretics” and “fundamentalists” echo throughout. In centuries past, heretics were burned for their religious views. However, in Godin’s 21st Century world, heretics may just be the ones that save us from an unremarkable world. Q. What inspired you to write Tribes? A. I see a world where just about everyone is pushed to conform, to fit in, to do what we’re told. A workforce filled with sheepwalkers… at the same time, I see people desperately in search of leadership, eager to be connected and to matter. I was hoping to point those two things out and encourage people to take a breath and lead. Q. How does Seth Godin spend his day? A. I write, answer email, bother people, notice things, and run my company, Squidoo.com and my closed online site, triiiibes. Q. For readers who haven’t read Tribes, can you explain the general themes of the book and why you think everyone should buy it? A. The best thing to do is visit www.squidoo.com/tribesbook and see what other people had to say! I’m continuing to find some cool tools on the online course Connectivism and Connective Knowledge that participants in PAYW may find useful. Wordle allows you to make colourful word clouds which highlight key words and themes in any selected text that you might wish to display on your blog.